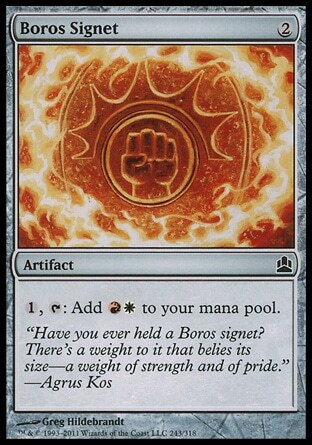 Another Magic Blog: Aurelia Combo: Building a Boros combo deck! 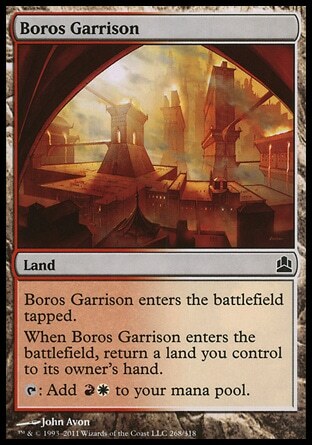 When you think of combo decks, red and white aren't usually the colours you think of. But while these two don’t necessarily lend themselves to combo as easily as blue and black, that doesn't mean they aren't good at it! Whenever Aurelia attacks for the first time each turn, you untap all creatures you control and get another attack step. If you ‘blink’ her in the end of the first combat, when she returns for the next combat, it will be her first time attacking again, as she will count as a new entity. Whilst ‘blinking’ generally refers to exiling and immediately returning to the battlefield, such as with cards like Cloudshift, there are other ways of replicating this effect, such as returning her to your hand and then returning her to the battlefield, or sacrificing her and reviving her with a card like Miraculous Recovery. 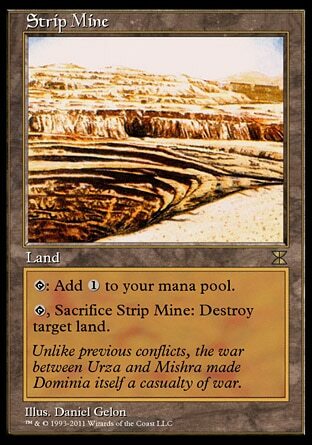 I wanted to build a deck that abuses this, particularly by generating infinite combat steps with Aurelia. The nice thing about making a combo deck with a general like Aurelia is that even if you don’t have the combo pieces, you can still play creatures and beat down and have a fairly good chance of still winning! Sun Titan + Angelic Renewal/Fiend Hunter, Reveillark + Karmic Guide, or Adarkar Valkyrie/Kiki-Jiki + Thornbite Staff and a sac outlet). There are other combo’s in R/W, but these are the most common, and the ones that will probably be most useful in an Aurelia Combo deck, as most of the pieces are useful even on their own. Now for combo’s with Aurelia. This is a list of combos you can use to reliably get infinite attack steps with Aurelia. While some of the combo’s are probably not worth including, either because they are unneeded, or the cards involved don’t do enough outside of the combo, I have listed them anyway to consider. Adarkar Valkyrie and a sacrifice outlet (discussed later) can lead to infinite attack steps. You can attack with everyone, untap them all and get a second attack phase. 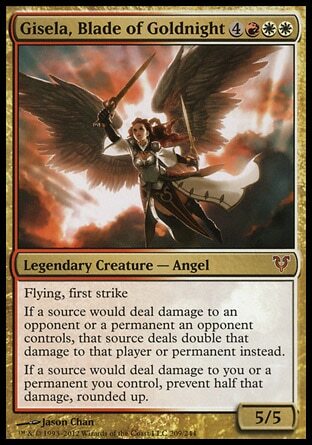 In the end of the first combat, tap Adarkar Valkyrie targeting Aurelia, so if she dies she gets returned to the battlefield. Then sacrifice Aurelia, she gets returned! Move to your next attack phase and attack, untapping all creatures, including the Valkyrie! 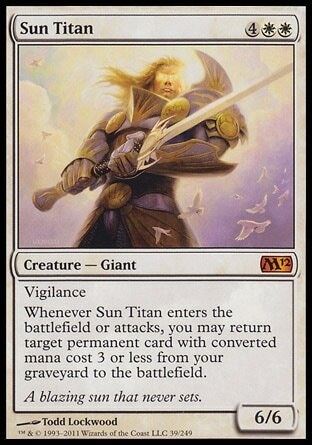 Sun Titan combo’s with Fiend Hunter and Angelic Renewal to make infinite sacrifices already, but they also combo with Aurelia for infinite attack steps. 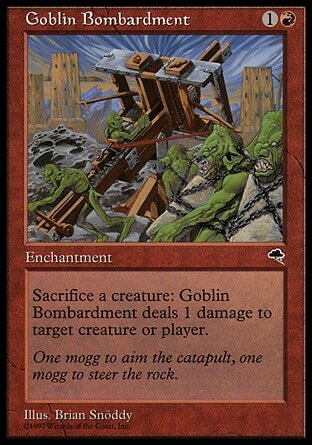 This is useful if you don’t have one of the sacrifice outlets that will win already (i.e Goblin Bombardment or Blasting Station). Attack with your team, untapping everyone and getting an extra attack step and bring back Angelic Renewal with Sun Titan. 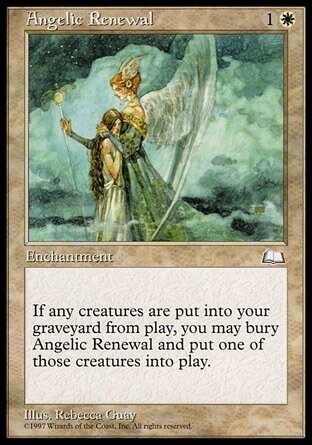 Then sacrifice Aurila in the end of combat, and sacrifice Angelic Renewal to bring her back. 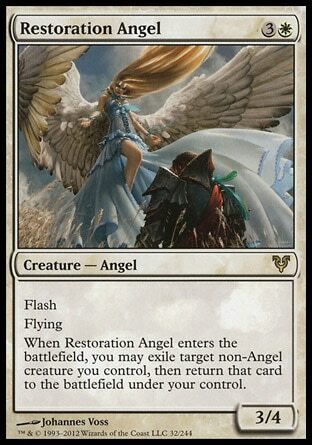 When you attack next time, bring Angelic Renewal back again. 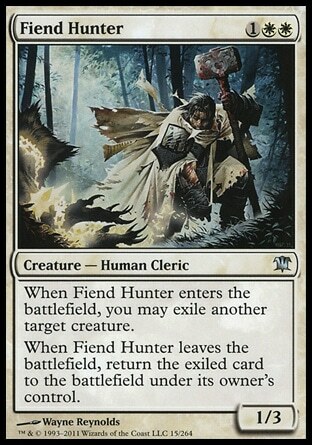 With Fiend Hunter, sacrifice Fiend Hunter pre-combat so he is in your graveyard. 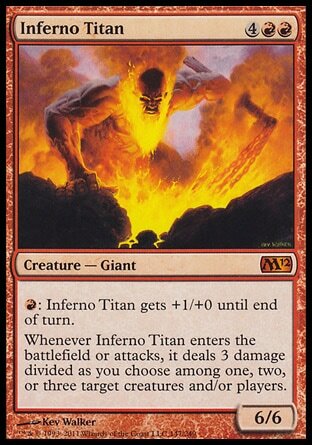 Attack with your team and bring back Fiend Hunter with Sun Titan. When Fiend Hunter enters, target Aurelia with his ability. In the end of the first combat, sacrifice Fiend Hunter getting Aurelia back! 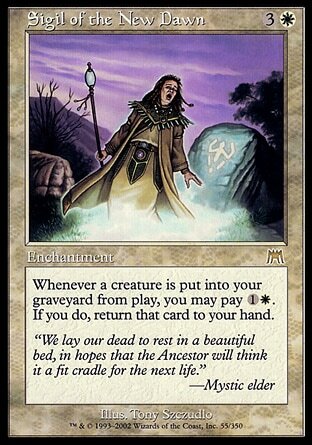 If you have a way of sacrificing enchantments (Auratog, Faith Healer, Claws of Gix) then this works with Oblivion Ring or Journey to Nowhere as well! You can use Aurelia equipped with Deathrender, a sac outlet, and a way of returning Aurelia to your hand to get infinite attack steps too. In the end of your first combat, sacrifice Aurelia with either Sigil of the New Dawn or Enduring Renewal on the battlefield. You can stack the triggers so that Aurelia is returned to your hand by Sigil of the New Dawn or Enduring Renewal, and the Deathrender resolves allowing you to put Aurelia onto the battlefield. Enduring Renewal and Deathrender will make your team very hard to kill on their own, and they also combo with any creature that can deal damage when it dies or enters the battlefield, as well as Goblin Bombardment and Blasting Station for infinite damage! Sneak Attack works much the same as Deathrender, though you need R to activate it each time. 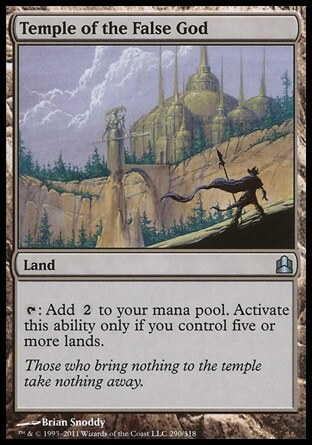 You can use Sword of Feast and Famine to untap your lands, or Iron Myr, as it will untap each time you attack! Sacrifice Aurelia in the end of combat step and use either Enduring Renewal or Sigil of the New Dawn to return her to your hand. You can then use Sneak Attack to get her back onto the battlefield! Sneak Attack is a great card on it own. Sneak Attack works well with both Enduring Renewal and Sigil of the New Dawn outside of the combo, plus if you use Restoration Angel or Cloudshift to blink the creature you Sneak Attack in, they won’t be sacrificed which is a good way of cheating in creature at instant speed before you have your combo ready. Now these are just silly, but if you really want to try them out be my guest. 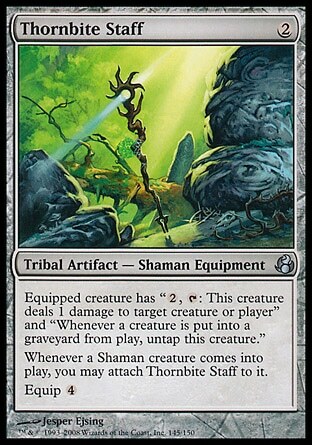 You need at least two artifact creatures and Clock of Omens. You can use the method above to return Aurelia to your hand with Enduring Renewal or Sigil of the New dawn and use Aether Vial, Quicksilver Amulet, or Dragon Arch to cheat her back into play instead of Sneak Attack. Each time you attack, you untap the artifact creatures which you can tap to untap the artifact you used to cheat Aurelia into play! Quicksilver Amulet and Dragon Arch either require creatures to make mana, like the mana myr, or Sword of Feast and Famine. 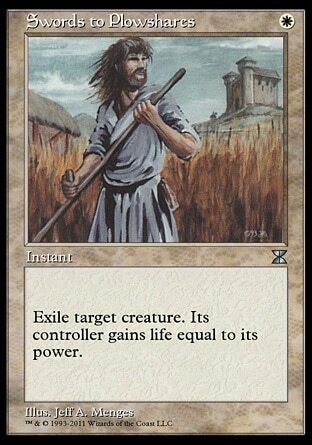 Pulsemage Advocate with a sac outlet and enough cards in your opponents graveyards will work for infinite combat steps. 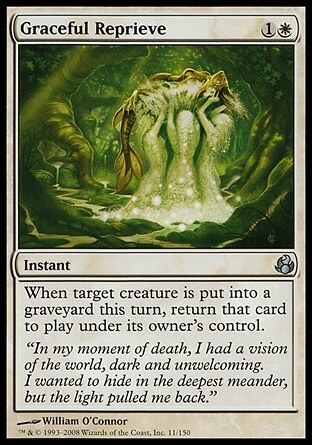 If you use Altar of Dementia then this is in infinite combo no matter how many cards are in your opponents graveyards. You can also sacrifice Aurelia before damage, allowing you to use this to mill your opponents, which is useful if they have flying blockers. You can use Parallax Wave and Opalescence to combo with Aurelia too. You can target Aurelia with Parallax Wave, exiling Aurelia. Then target Parallax Wave with itself, and it will exile itself, bringing back Aurelia and itself! 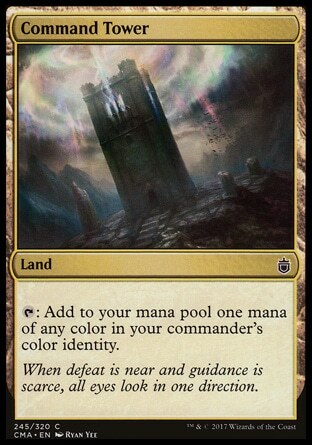 You can also use Parallax Wave and Opalescence to exile all of your opponents creature permanently. 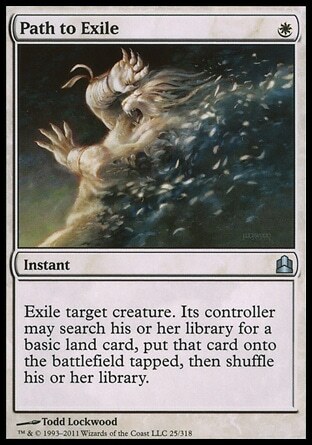 Target up to 4 creature an opponent controls with Parallax Wave’s ability but don’t let them resolve, then target Parallax Wave with itself. 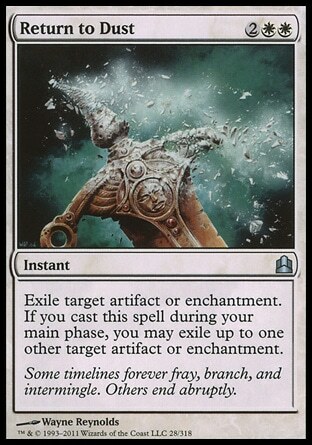 Parallax Wave will exile itself, then return itself, then the other exile triggers will resolve and the creatures will be exiled forever! Parallax Wave and Opalescence are both not very good outside of this interaction however, and you need them both out at the same time. 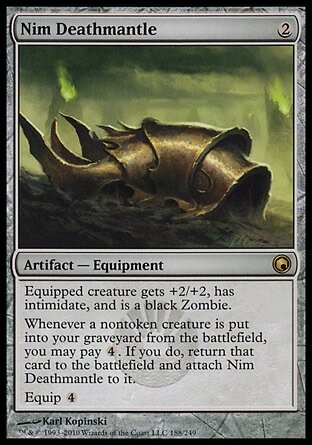 As for the sac outlets available, for infinite damage you can use Goblin Bombardment or Blasting Station, Ashnod’s altar for colourless mana, Phyrexian Altar for coloured, and Altar of Dementia for mill. 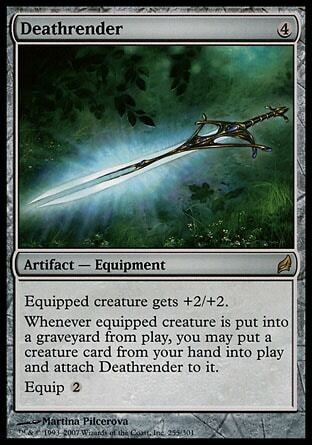 Fanatical Devotion works as a sac outlet and helps protect some of your team from wraths, and Martyr's Cause helps to prevent damage, and even though these don’t do much with the aforementioned combo’s, they can be used as an enabler for other combo’s. Lets have a look at the cards from our combo’s. Cuts The first thing to do is to cut some of the cards we don’t need. 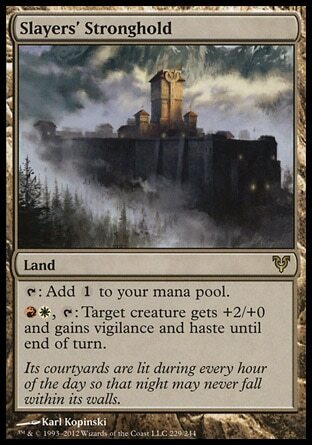 I would suggest cutting any card that doesn’t do enough outside of the combo to warrant inclusion on its own. 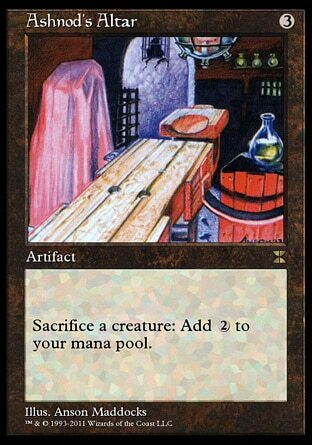 For me, this would be: Village Bell-Ringers, Pulsemage Advocate, Second Sunrise, Surprise Deployment, Alter of Dementia, Aether Vial, Quicksilver Amulet, Parallax Wave, Opalescence, and Auratog. Some of these cards would be fine if you built the rest of the deck to use them if that is how you want to build your deck. Out of the cards remaining, there are a few that I might still remove, but I would like to test them first. Likewise with the ones I removed, I may end up testing them in the deck anyway. Being able to tutor for your combo pieces is important. If you can reliably get the combo pieces to your hand, or graveyard if that's where they need to be, then your deck will combo off more consistently. 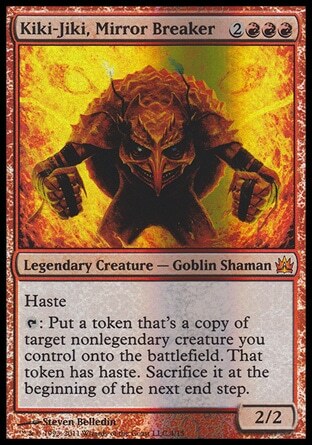 Red and White aren’t the best for tutoring for creatures, but red has some decent card draw in the form of wheel effects, and white can tutor for enchantments and artifacts pretty easily. 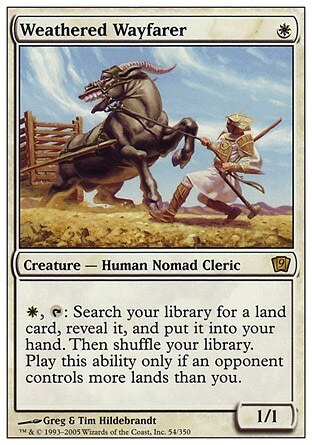 Idylic Tutor can search for any of the enchantments. 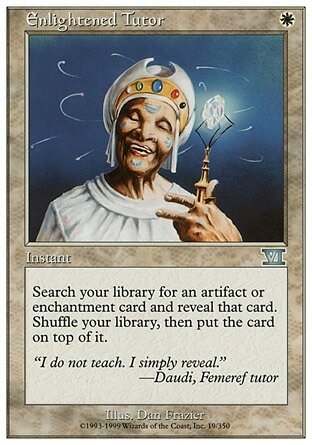 Enlightened Tutor can search for any of the artifact or enchantments. 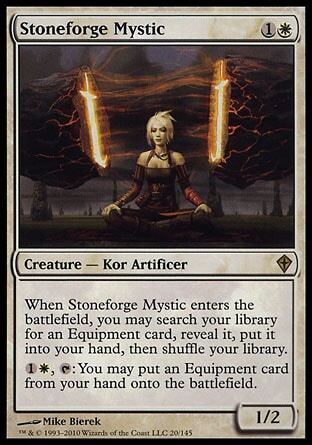 For the equipment, you we have access to Steelshaper’s Gift, Stoneforge Mystic and Stonehewer Giant, among others. 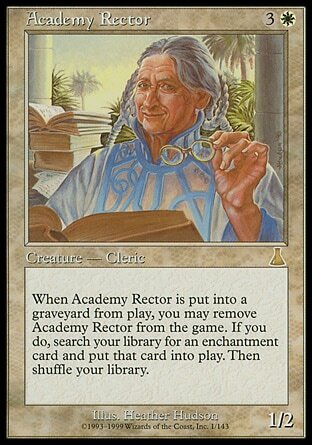 There is also Academy Rector which can be sacrificed, or killed some other way to tutor for any enchantment you need. 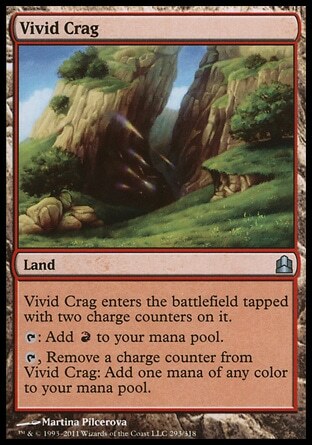 Red brings us Gamble, which while I don’t suggest to run it in many decks, in a deck such as this one with lots of recursion, Gamble is a fine tutor to use. When using Gamble, be careful how and when you use it. 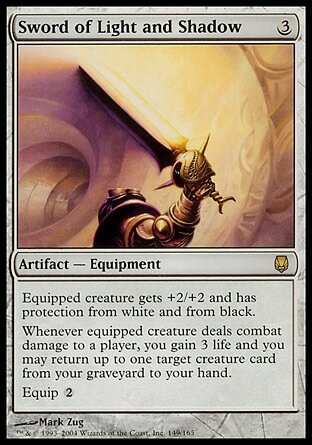 You don’t want to use it if you have an important combo piece in your hand that you can’t afford to discard. It works well in this deck because with Sun Titan out, you can tutor for any combo piece with CMC less than 3, and it doesn’t matter if you discard it. 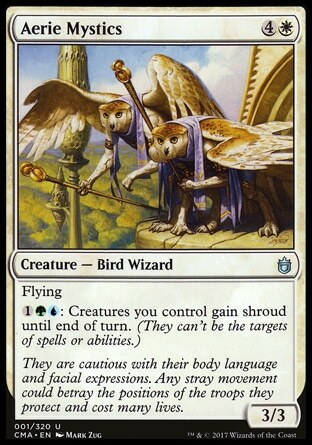 With Karmic Guide in hand, on the battlefield with a way to blink it, or in the graveyard with a way to recur it, you can safely tutor for any creature. You can also safely tutor for any creature if you have Miraculous Recovery or Graceful Reprieve in hand. Using Aurelia as a general means you already have a second strategy to fall back on. 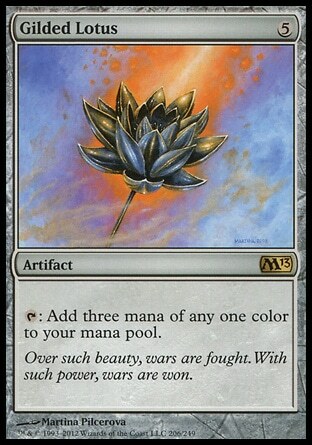 Depending how you build the deck, this could be considered the primary win condition, using combo to when if you draw into it! There are a whole lot of creature you can include in this deck. If you want to fully abuse Aurelia’s extra combat steps even without a combo, then consider creatures with powerful effects either when they attack or when they deal combat damage. Godo, Bandit Warlord both adds another attack phase of his own and tutors for equipment. Most of the combos that work with Aurelia will work with him as well. Hero of Bladehold gets two tokens every attack step, and battlecry triggers at each attack step as well. If you attack 2 or 3 times in a turn with Hero, battlecry will stack making her boost your whole team multiple times. Márton Stromgald’s ability triggers every time he attacks. If he survives the first round of combat he boosts your team further with the second round of combat. The boost you get from Marton Stromgald is insane, but its attached to a very frail body thats unlikely to survive long. 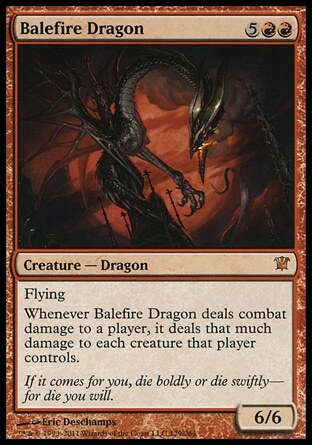 Balefire Dragon can hit different opponents each combat, clearing the way of blockers. 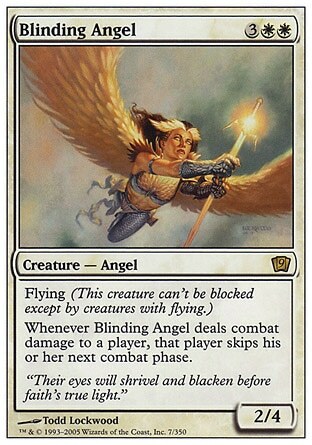 Blinding Angel can ensure your opponents don’t try to attack you back during their turns. 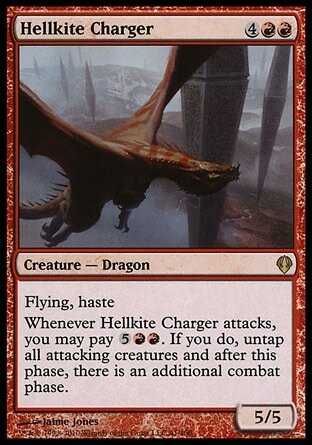 Hellkite Tyrant can steal your opponents artifacts, hitting a different opponent each combat, and potentially winning you the game if you steal enough! 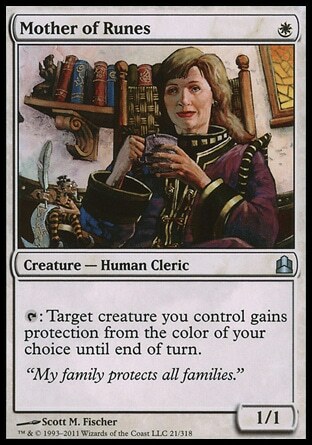 Odric, Master Tactician can ensure you creatures don’t get blocked and make short work of your opponents. Mother of Runes can protect your most important creature, and can be used to ensure an attacker gets through. With Aurelia, you can use her twice, as Aurelia will untap her too. 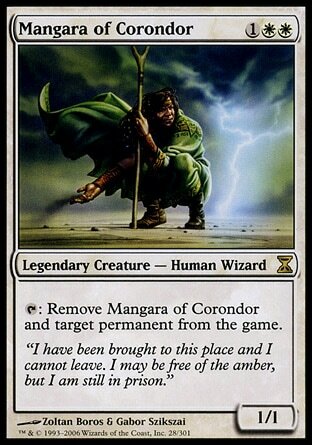 Mangara of Corondor can be used to get rid of any problem permanents. You can also blink him or sacrifice him in response to his trigger to use him more than once! 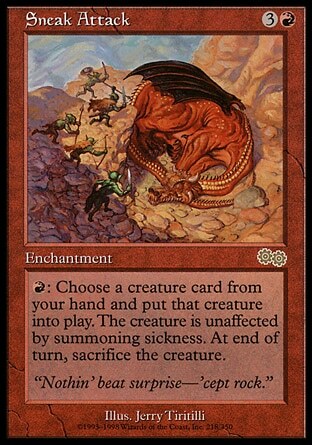 Eternal Dragon is a nice way to find plains early game, and another creature to beat down with late game. Anger gives all your creatures haste if he is in your graveyard which is easy enough to do. 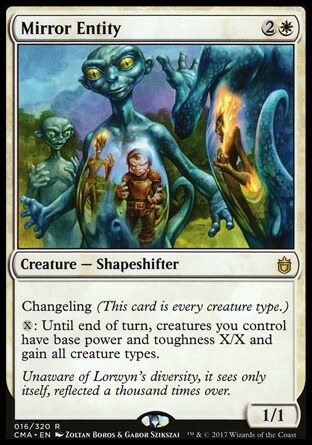 There are ramp creatures like Kor Cartographer and Solemn Simulacrum. These are great to help speed you deck up. 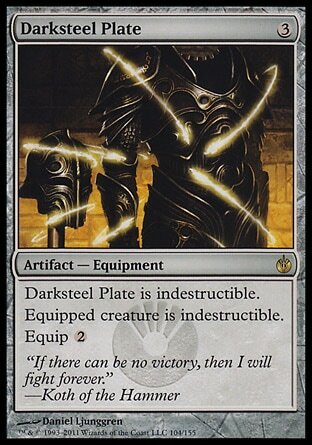 There are other utility creatures, like Grand Abolisher, Linvala, Keeper of Secrets, Zo-Zo, the Punisher, Goblin Welder, or Duergar Hedge-Mage. Whether or not you include many of these will very much depend on your meta. 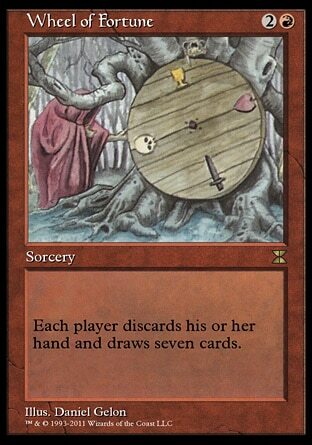 Red has access to one of the best card draw spells, Wheel of Fortune. In a deck like this one, where you can recur a lot of your combo pieces, ditching a hand of things you don’t need right now but can recur later is extremely powerful, and can hinder an opponents plans. 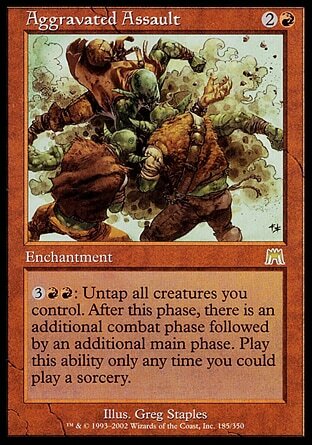 Watch out though, as you may also be filling your opponents hands with ways to stop you, and graveyards with cards they can abuse themselves. 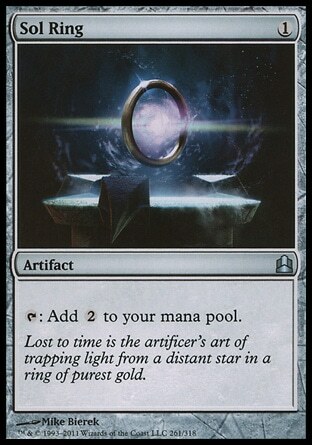 There are other similar cards to Wheel of Fortune such as Reforge the Soul that can be used too. Dragon Mage is a beast at drawing new hands, especially with multiple attack steps. 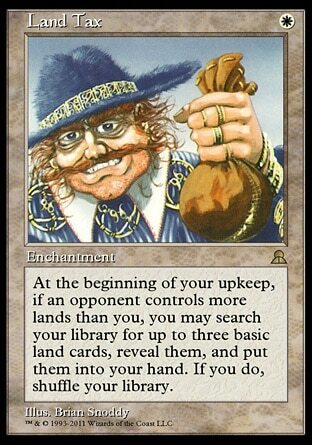 You often won’t mind ditching your hand if you can recur the important pieces, or if you are digging for one piece in particular, and if there is a card in your hand you can’t afford to, or just don’t want to get rid off then you don’t have to attack. 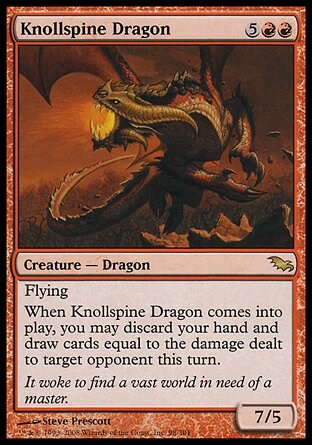 Knollspine Dragon is another great card for drawing a new hand. 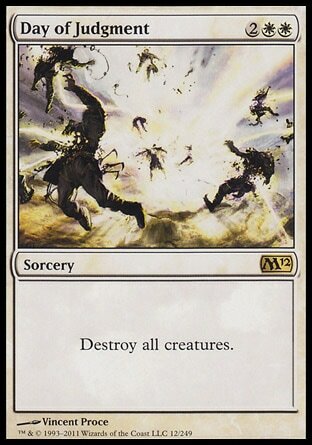 While it does require an opponent to have been dealt damage, making it only really useful after you have attacked, it can draw you a whole bunch of cards and set you up for your next turn. Scroll Rack is one of the best card draw artifacts if you can combine it with a shuffle effect. White also has access to Land Tax. 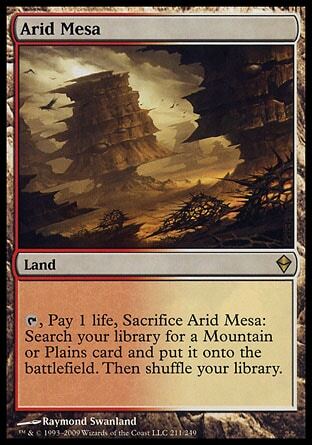 Scroll Rack and Land Tax combined give you an insane amount of card draw and filtering. 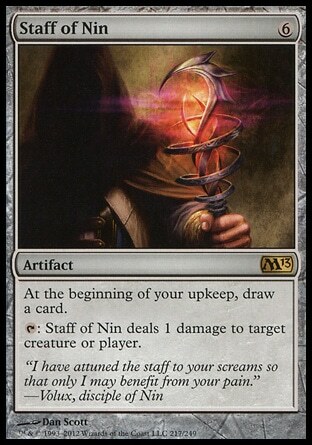 Staff of Nin is a one sided Howling Mine and it lets you ping your opponents or creatures for 1 damage, what’s not to love! 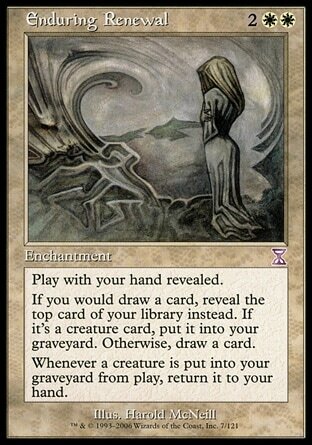 The extra card draw is really useful, and often needed in a r/w deck. 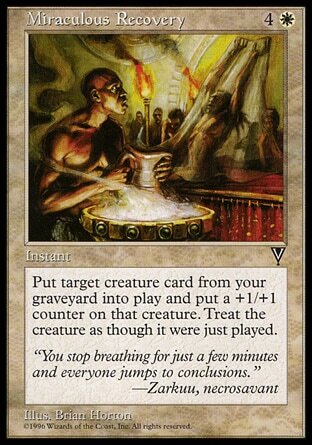 Skullclamp is great card draw, especially in a deck that is already planning on sacrificing creatures for value. 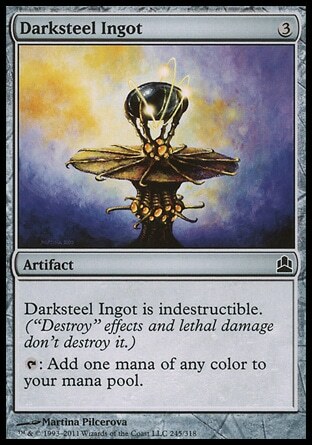 Dangerous Wager, Faithless Looting, and Wild Guess, while they are all card draw or filtering, they don’t draw enough compared to the downside of discarding a card and probably aren’t worth it. 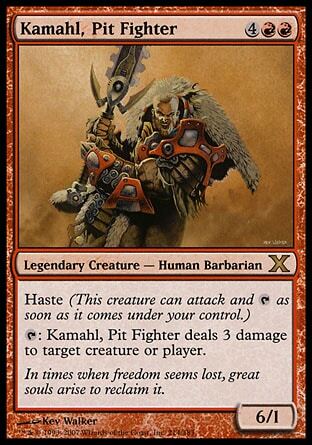 And also wraths Day of Judgment, Wrath of God, Austere Command, and many other options. 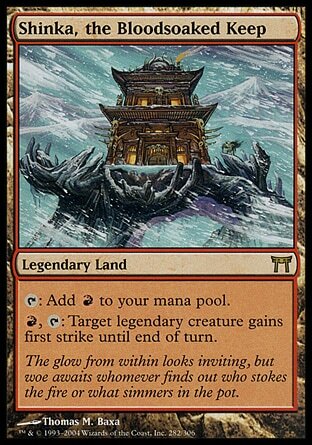 White and Red don’t have very many ramp options except for artifact ramp. Artifact ramp is pretty straight forward. 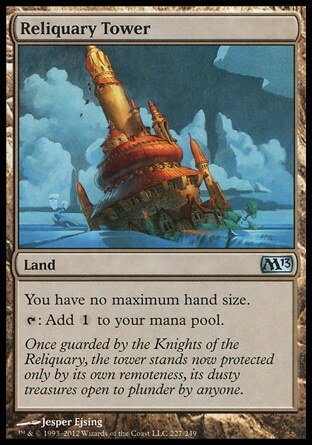 The deck has a pretty high mana curve, and wants to be able to play more than one combo piece on the same turn, so there needs to be quite a lot of ramp. 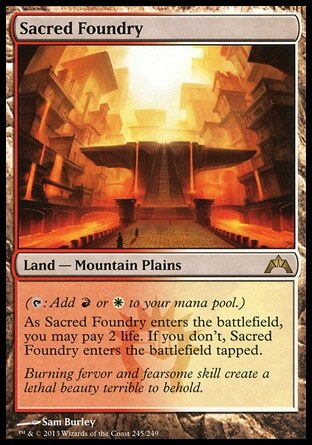 Cards to consider are Sol Ring, Boros Signet, Darksteel Ingot, Worn Powerstone, Thran Dynamo, Gilded Lotus, Boros Keyrune, Coalition Relic, Everflowing Chalice, Mana Crypt, Mana Vault, Marble Diamond, Mind Stone, Mox Opal. 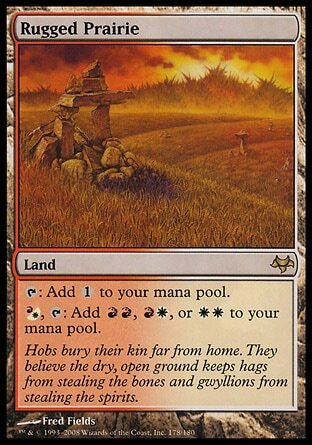 There are plenty of hate cards to stop other peoples strategies, the best ones are Stranglehold, Aura of Silence, Price of Glory, and Manabarbs, though there are many others. 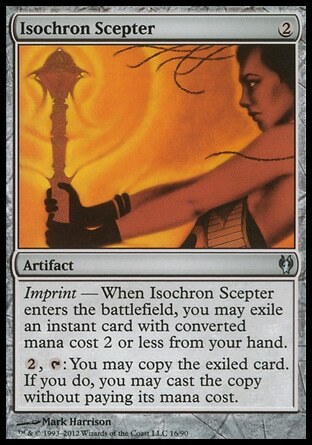 Isochron Scepter is good with some of the cards we have considered, such as Cloudshift, Path to Exile, Swords to Plowshares, Vandablast for artifacts, Return to Dust for artifacts and enchantments. 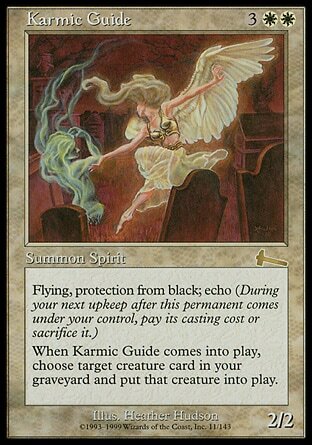 If we use Isochron Scepter, then there are other cards that are good under it such as Orim's Chant and Silence. 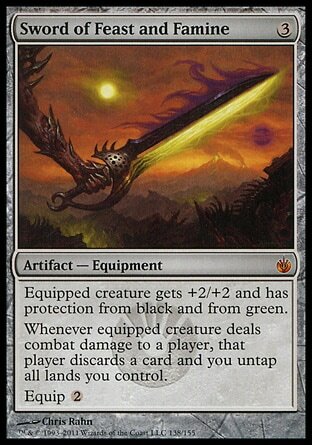 Sword of Light and Shadow can be used to bring back combo creatures to your hand and as protection. 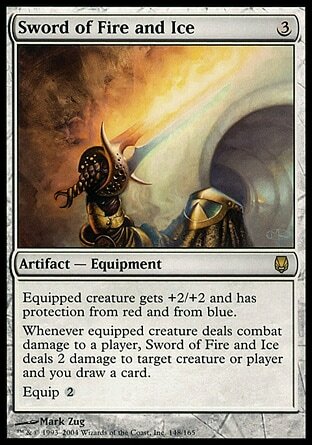 Sword of Fire and Ice is card draw and removal. Sword of War and Peace can speed up the clock if you are using the aggro strategy. 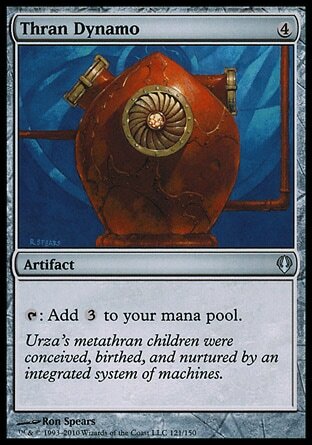 Umezawa’s Jitte is removal and creature pump all in one. All of these work really well with multiple attack steps. 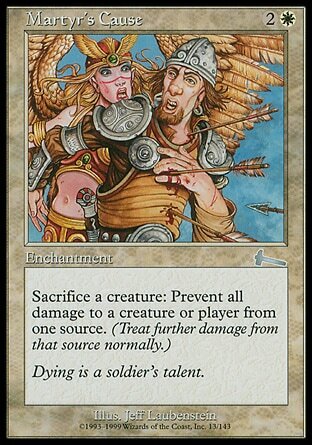 A lot of the combo’s require you to be able to attack your opponent without your creatures (including Aurelia) dying. This means Aurelia and your other creature will need some kind of protection, such as Swiftfoot Boots, Lightning Greaves, or Darksteel Plate. 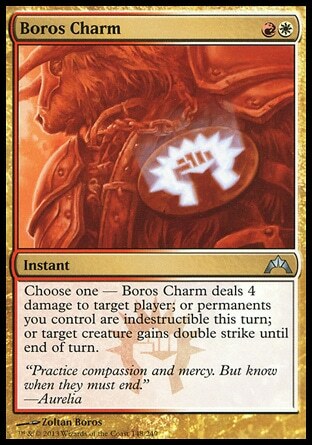 Boros Charm can give your creatures indestructible until the end of turn to protect you from wraths. 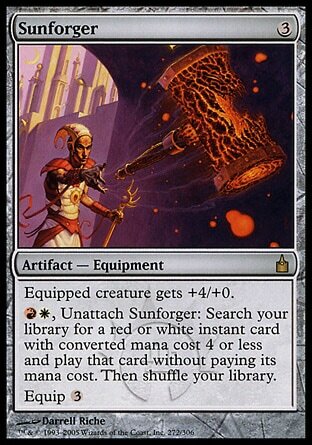 Sunforger is a nifty piece of equipment that can be used to search for removal, tutors or answer for other peoples spells, like Boros Charm. 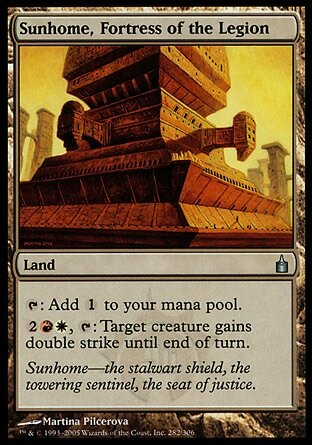 If you wish to include a Sunforger package, there are many cards like Master Warcraft, Boil, or Ghostway that are great with Sunforger, though often not good enough to warrant inclusion without it. These are all the cards and strategies I looked into before trying to come up with a decklist, but these were the main ones. Some of them won’t be in the final deck list, and I will probably have some cards not mentioned here too. After some testing, I found that some of the combo's were to slow, or involved pieces that weren't very good on their own. 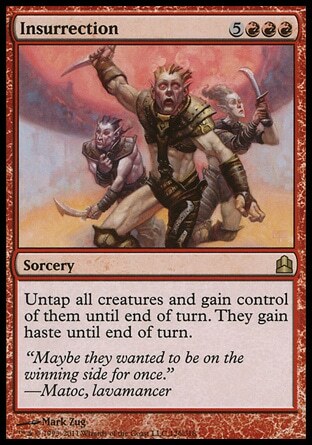 I often found that the best path to victory was just going the aggro route and if you drew a combo or a tutor for a combo, then use that to end the game. It plays very much like an aggro deck with a few combo's in it, and because of there, there are a few changes that I would like to make to make it better over all. Firstly, I took out Marton Stromglad as he is to fragile. He never survived an attack unless the opponent didn't have any creatures out, at which point I was winning anyway. I replaced Marton with Hero of Bladehold. 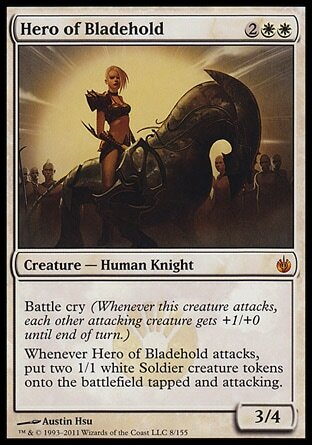 Hero of Bladehold has battlecry, which is really good in multiple attack steps, and makes an army of tokens. 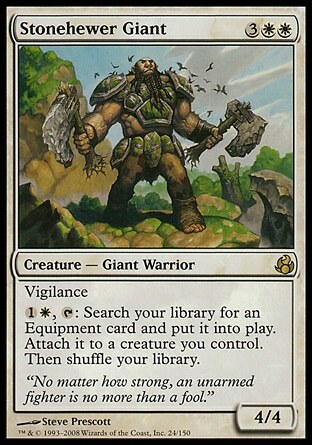 Karn, Silver Golem was to 'cute' and never worked out, which is kind of a silly thing to complain about, because most of the combos in this deck are 'cute'. 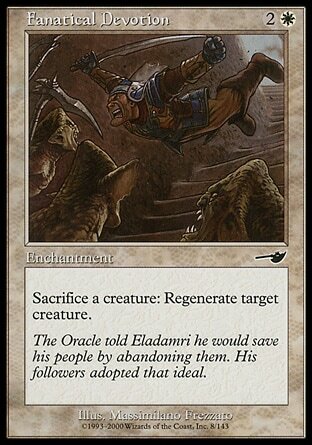 While he was useful to unequip your opponents creatures, he was never as good as I hoped he would be. I may continue to test him however, as there were occasionally games where he was great. 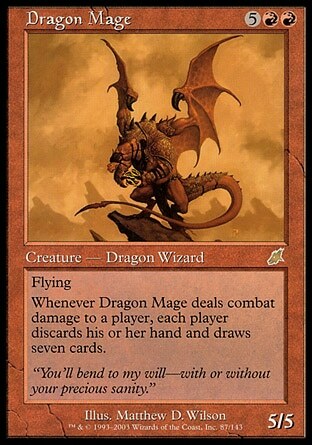 I have currently replaced him with Knollspine Dragon. 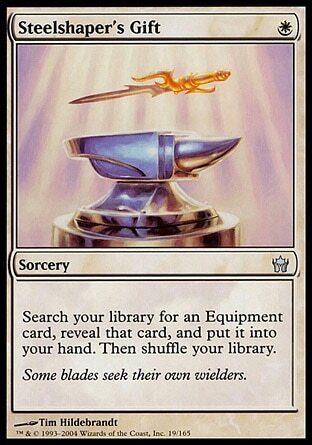 I took out Spellbinder as I often sat with it in hand waiting to draw a spell I wanted to cast. 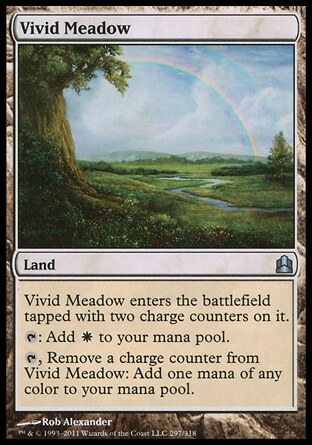 Even if I did draw a Path to Exile or Cloudshift, if I wanted to cast it, I had to have 7 mana and an evasive creature to cast it from Spellbinder that turn. I replaced Spellbinder with Sunforger, as it lets you tutor for removal or Enlightened Tutor. 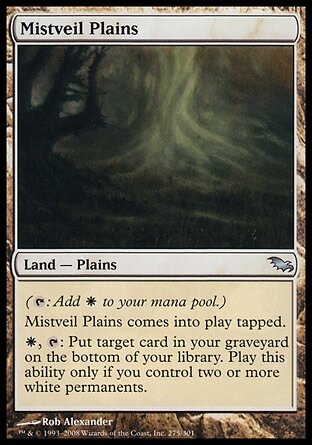 Reveillark doesn't have enough targets in this deck, and mostly sits in my hand, or is just cast as a beater. 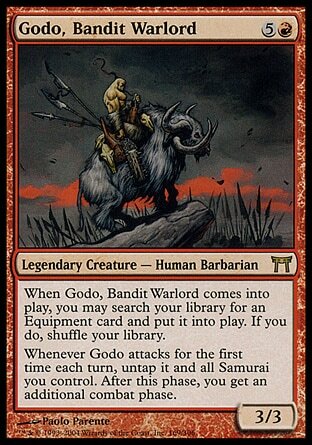 I'm currently testing Godo, Bandit Warlord instead. This deck is still in the testing stage, and I imagine it will change quite a lot over the next few weeks as I iron out the kinks and make it play as consistently as possible, while still sticking to the aim of the deck - to combo out with Aurelia! 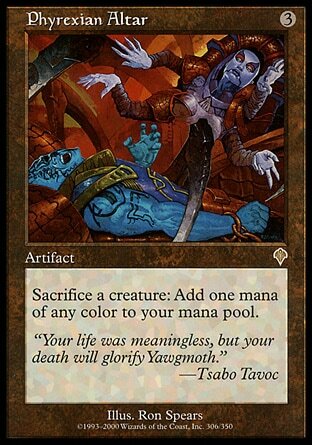 I think the deck would probably be fast and more consistent by taking out some of the combo's and combo pieces, like Enduring Renwal, Nim Deathmantle, Ashnod's Alter, Fanatical Devotion, and replacing them with more Sunforger targets and aggressive creatures. If you want to play a fast, aggressive deck, I would suggest taking those out. 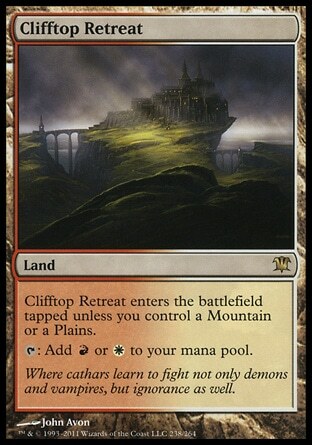 However, this deck is a lot of fun to play and has some really neat interactions that people often aren't expecting. The current version fits my play style much better. While this deck is not my most competitive deck, its a blast to play and it still does really well against most of the other decks in my playgroup.